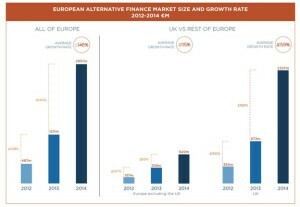 Home › Stock Market › How is the European Alternative Finance Market Doing in Growth Charts? Unlike most global markets, the European market is a bit different. In addition to its traditional market exchanges, the European market also has a sub-market known as the alternative finance market. This sub-exchange includes financial instruments and distributive systems that work outside of the traditional and outdated financial system. This financial system also allows for what is known as crowdfunding systematics, which is the practice of funding a project or venture through generating small amounts of money from numerous individuals. This type of systematic is mainly undertaken via online channels. For those who track the market through their own methods or via multilingual investment trading platforms like Alvexo, it is always important to know what the projected performance of a market is. In terms of the Alternative Finance Market, the performance seems to be pretty positive. As of yet, the market is estimated to have 385 million euros of early state growth. To add, there has also been a spurt of capital finance for tens of thousands of European start-ups. Analysts are projecting that the market is poised to grow beyond 7,000 million euros in 2015. This analysis is solid based on the assumption that the fundamentals of the market will not deviate and that growth will continue at the current pace that it is at. There are many features of the alternative finance market that make it a successful market. Yet, one of the main markets of success is the ability of the alternative finance market to take hold on a global scale. Markets worldwide are witnesses the emergence of alternative finance channels that are separate from the traditional capital markets. In the European market, there has been a 144% growth in the market and 620 million euros worth of transactions. Furthermore, the platforms have also been strongly taking hold throughout Europe as more individuals realize the magnitude of how beneficial the market is. Next to the UK, France and Germany are also seeing strong results, with markets valued at 154 and 140 million euros respectively. Overall, it seems that 2015 is going to be a more than positive year for the alternative finance market. The best way to realize this success is to continue to monitor the market’s growth and potential in the coming months. However, there is nothing to indicate that current predictions are going to falter. April 20, 2015 How is the European Alternative Finance Market Doing in Growth Charts?